We want your Major Concert Experience with us to be as easy and enjoyable as possible. If you have questions about the event you are attending, then this is the place to be. Please watch our short video or read over our frequently asked questions, it covers everything you need to know. No, Sandstone Point Hotel is an open-air, outdoor venue. Is Sandstone Point Hotel open to the general public on the day of the concert? No, we will only be open to ticket holders only. All ticketing information can be found on our website under the Entertainment & Events section. This includes our VIP packages or pre-ordering hampers. You can also purchase tickets for any concert at the Sandstone Point Hotel Bottle Shop. If you have questions about your tickets please contact the company you purchased them from. Some of our concerts will be all aged events with under 18’s tickets being issued at the Promoter’s discretion. Pricing, availability & allocation are set by the Promoter and are available only from ticketing agency. Please direct any questions or requests for Under 18’s tickets to the Ticketing Agency. 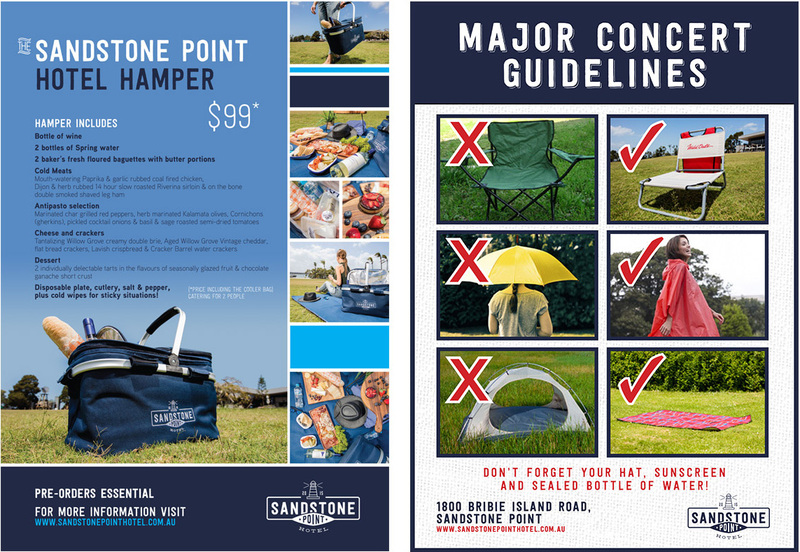 If your concert is an all aged event, Sandstone Point Hotel’s major concerts guidelines follow the same rules that any minor would experience at your local pub. Under 18’s must be accompanied by a responsible adult at all times and are not allowed to approach the bars at any time. We do not recommend bringing babies or young children to our concerts due to the noise levels and the number of patrons attending. If you do not have a designated driver in your party, we strongly recommend the best option for transport which is to catch the train to Caboolture. To make the travelling process easier for concert goers, for some of our events we will have bus services running to and from the Caboolture train station which is a 20 minute trip. Please check our Facebook event page to see if this service applies to your event, or call our Hotel and ask our friendly staff on (07) 3475 3001. A $2 donation will be required to park onsite at events, 100% of car park profits go to the Volunteer Marine Rescue. We have Traffic Marshals who manage the car parking process. They do a great job of getting people in and out as quickly as possible so please make sure you follow their instructions. Some VIP packages will include premium parking. If you have purchased a VIP ticket, please make yourself known to our Traffic Marshals and they will direct you to your premium parking area. There is accessible parking available close to the main entry gate of the Hotel and the Concert. If you are planning on using this facility please make sure you have your valid disability parking sticker/permit displayed in your window. The car park closes at midnight on the day of the event and camping overnight is prohibited. Can I line up early? We understand you will be excited however there are no facilities or shade outside the venue and it can get hot while standing in the queue. While we understand some patrons want to be first in best dressed, when it comes to General Admission seating we recommend that you line up only a short time before the advertised gates open time. The gates will not open early just because there is a long queue. Yes, for the majority of our concerts seating options are available in varying concert experience styles. The seating plan can be found on the ticketing agency’s website so you can see the layout of the concert. Our General Admission section is an option for those who don’t require standard seats and enjoy feeling the grass between their toes. The General Admission section welcomes picnic blankets and beach chairs (please make sure your chairs legs are not any higher than 20cm). For anyone who requires a standard chair, we strongly recommend purchasing a reserved seat as standard BYO folding chairs will NOT be allowed in the General Admission section. Please be aware that while there are reserved seat shows, patrons may stand during the performance. The seating style depends on the Promoters of the event. Your ticket will explain if the concert you are attending is an all seated, all standing or a mixture of both seated and standing. This depends on the seating style chosen for the particular concert you are attending which is decided by the concert Promoter and their site manager. No, we are a fully catered venue and there is strictly no BYO food policy. It is a condition of entry that a search of person or possession may take place with prohibited items confiscated by the Promoter. 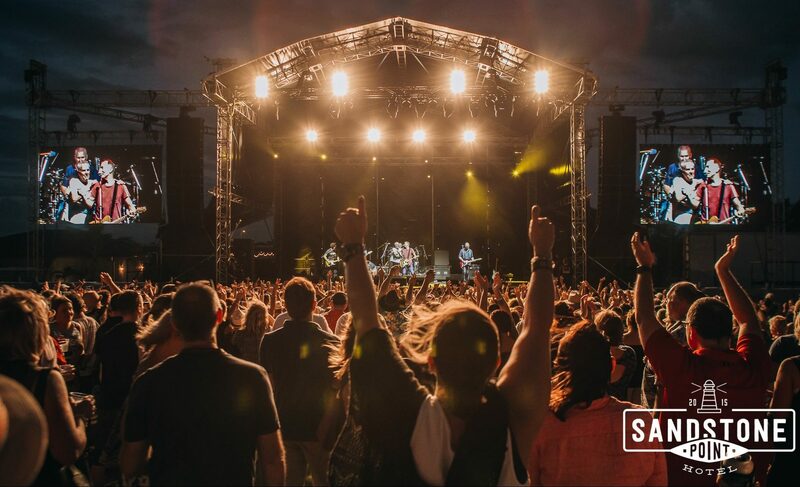 Sandstone Point Hotel offer a number of food vendors and stalls along with catered hospitality packages that include food & beverage along with a ticket to the concert. Or, if you prefer something more relaxed, you can pre-purchase a picnic hamper that caters for two people complete with a bottle of wine, cold meats, antipasto, cheese & dessert. No, we are a fully licenced venue and there is a strict no BYO of beverages policy. We do allow you to bring a bottle of water however it must be sealed. It is a condition of entry that a search of person or possession may take place with prohibited items confiscated by the Promoter. There are multiple bars located around the grounds selling beer, wine, spirits, soft drink & bottled water. Our Hotel has a fantastic coffee stall that exceeds the need of every coffee addict, with some concerts also having a coffee stall on the grounds to guarantee you that much needed caffeine hit. In accordance with our alcohol management plan, no alcoholic beverages can be removed from the venue on concert days. Is your Restaurant open on the day of the concert? Yes our Restaurant is open for ticket holders only. If you are planning on dining in on the day of the concert, please make sure you book well in advance because we book out quickly. What is in the Sandstone Point Hotel Picnic Hamper? We have a wide range of gourmet products in our Picnic Hampers. The Picnic Hamper caters for two people and includes a bottle of white, 2 bottles of water, 2 floured baguettes, cold meats, an antipasto selection, cheese and crackers, dessert, along with plates, disposable cutlery, salt and pepper and cold wipes for any sticky situations. There are very limited numbers of the Picnic Hampers available on the day so we recommend everyone pre-purchase a picnic hamper at the time you purchase your ticket to avoid disappointment. If you have already bought your ticket but want to purchase a Picnic Hamper you can easily log back into your profile for the ticketing company and add it to your order. I have bought a Picnic Hamper, where do I pick it up? Nice work on purchasing a picnic hamper, they are a great addition to your concert experience. You pick your hamper up inside the concert space. The pick-up station will be noticeably signed along with being marked on your concert map. If you are having issues locating the pick-up station, please ask one of our friendly staff. I’ve bought a ticket that includes a food and beverage package, what time should I arrive? Sandstone Point Hotel’s VIP packages which include food and drink beverages are all run at varying times. Please make sure you refer to your ticketing information to see when your package begins. Food service will finish before the main act takes the stage. To ensure you get the most out of your package please ensure you arrive on time, if you arrive late you may miss some of the food options or service. Can I use my card to pay for drinks? No, all of our bars are cash only. Yes, we have two ATMs inside the Hotel with portable ATMs outside. While we do have these facilities it is advised that for convenience you plan ahead and bring the amount of money you think you may spend on the day to avoid lining up. Yes, but only in the designated smoking areas – these areas are determined by the Promoter’s site manager. Yes. BIG4 Sandstone Point Holiday Resort is our on-site accommodation. Head to www.sandstonepointholidayresort.com.au to book! If you missed out on booking in with us, there are plenty of other accommodation options available in the area for you to make the most of your time in beautiful Bribie Island. If it rains you may get a little damp because the concert will proceed rain or shine. By purchasing a ticket you acknowledge the venue is an open air space and no refunds or exchange will be given in the event of bad weather. If it looks overcast we recommend bringing a rain poncho and gumboots as umbrellas are not allowed inside the venue. No refunds will be given to those who decide not to attend the concert due to weather conditions. If weather conditions deem dangerous for the artist to perform or put the patron’s safety is at risk, the promoter may cancel the concert and issue a refund. Our concert space loves swallowing heels and as it is grass underfoot, we would advise you wear comfortable flat shoes. Also, because we are an open air venue we would suggest to dress for the occasion. Depending on the season you may need to bring with you a warm coat, water proof jacket, rain poncho or gumboots. Always remember to slip, slop slap because even though it may be overcast the UV rays can still break through the clouds. In the event of wet weather please remember that umbrellas are not allowed. The gate open time does not reflect the time in which the music begins. The time the main act, and support act/s take the stage varies and is dependent on the Promoter, Artist/s and the weather conditions. Set times will be advertised as soon as they are available and will usually be listed on the ticketing agency’s website a couple of days before the concert. There is time between when the gates open and when the music starts to allow patrons leisurely access without having to queue for long periods beforehand. We will do our best to advise you of the set times however the lead up time in which the Promoter announces the set list is not our responsibility. We will advertise the list on our Social Media platforms as soon as it has been finalised. Accessible parking is available near the main entry point to the Hotel and Concert. You will be directed to the accessible parking spaces by our Traffic Marshals. Accessible toilets are located inside the Hotel. Accessible seating arrangements and companion tickets are handled by the Promoter & Ticketing agency – please refer any questions to the Ticketing agency for the concert. Any Security guards at the gates, outside the venue and inside the venue are appointed by Sandstone Point Hotel. If you have any issues please direct your questions to Hotel Staff. What are your policies on Responsible Service of Alcohol? Sandstone Point Hotel takes the Responsible Service of Alcohol very seriously. At every concert we have Security Guards and RSA Marshalls roaming the venue. Patrons are assessed upon entry to the venue and if deemed to be intoxicated will be refused entry. Police and security guards also patrol the car park to ensure patrons are not “pre-loading” before entering the concert arena. If you are concerned about the condition or behaviour of patrons near you please alert one of the Security or RSA staff members. Can I visit your Bottle Shop at the concert? No, in accordance with our alcohol management plan the Bottle Shop is closed on concert days. If it is a seated concert does that mean I can’t dance? No, we want everyone to enjoy the music as they see fit however we do want to be considerate of the people around and behind you. If you are attending a seated concert and would like to get up and dance there will be designated standing areas to the side that will not block anyone’s view. Any lost property that is found by or handed to a Sandstone Point Hotel staff member is held at the Hotel. If you have lost an item while at a concert please call our Hotel and provide a detailed description. Any other object that the promoter considers inappropriate or dangerous. By purchasing a ticket you acknowledge that you enter the Venue and Event at your own risk. By purchasing a ticket you acknowledge that the venue is an open air space and no refunds or exchange will be given in the event of inclement weather. It is an all-weather venue, no refunds will be given if you choose not to attend due to weather conditions. At Managements discretion, they have the right to refuse entryor to eject a ticket holder for behaviour likely to cause damage, injury and nuisance or for failure to comply with reasonable requests. Those evicted from the Venue will not be re-admitted to the Event and tickets will not be refunded. Intoxication, aggressive or anti-social behaviour is not acceptable and will result in discharge from the Venue. By entering an event you agree to being filmed and photographed during the event. Footage or images may be reproduced, published and exploited by the Promoter without limit including but not restricted to marketing and promotional use and in all media. During an event, patrons must follow official directions by Venue staff and security and remain on designated pathways. The concert styles will vary in accordance with the event organisers. By purchasing a ticket you acknowledge the concert style (all seated, all standing, mix of both seated and standing) and agree to abide by the concert regulationsout of consideration for other concert attendees. We are within our rights to ask people to leave if they do not follow these guidelines. All patrons must adhere to licensing laws. Any patrons who are intoxicated or disorderly will be evicted from the venue. Management reserve the right to refuse entry. Trespassers and anyone helping or supporting trespassers will be ejected from the Venue. No Passouts will be permitted. If the event organiser permits, persons under 18 must be accompanied by a ticket-holding parent or legal guardian at all time and must also have a valid ticket. If the event is 18+ then underage attendee’s will not be permitted. At the time of booking your tickets, you agreeto these Conditions of Entry AND the Ticketing Company’s terms and conditions of purchase. Defaced tickets will not be accepted and you may be refused entry if your ticket was purchased from an unofficial ticket seller or ticket scalper.Lost or stolen tickets will not be replaced or reissued, even if you have proof of purchase. Your ticket is your responsibility. Wristbands may be provided at the Event for reserved seat ticket holders. Wristbands which have been removed or tampered with will be rendered invalid and will not be replaced. Wristbands are your responsibility and any lost or missing wristbands will not be replaced. At the time of entry to the Venue, it is a condition of entry to all Events that a search of person or possessions may take place. Prohibited items will be confiscated by the Promoter. The Promoter accepts no responsibility for confiscated items. Out of consideration for the people around you, no tables, tents or sun shelters. Umbrellas are also not permitted. If it is raining please bring good quality raincoats and gumboots instead. We allow picnic rugs to sit on and folding beach chairs, however normal folding chairs will not be permitted. Depending on the event, there may also be areas where no chairs will be allowed. BYO alcohol is not permitted. Alcohol is available for purchase at the Event. Patrons found to have brought alcohol into the Venue will be ejectedfrom the Venue. Patrons who wish to consume alcohol must have photo ID. Due to liquor licencing laws, it is an offence to supply minors with alcohol and anyone found doing so will be evicted from the Venue. No BYO soft drinks or any other non-alcoholic beverages. Drinks required for dietary or health purposes are allowed in sealed containers with written consent from a health professional.Bottled water is permitted, however it must be sealed. No BYO glass of any kind-this includes wine glasses, jars, or any other containers or items made of glass. Although bottles of wine will be sold inside the Venue you may not bring any glass object into the Venue. No metal cutlery or knives are permitted into the Venue. Please note, what you bring is with you for the day as there are no passouts issued and there is no locker or bag holding facilities. Professional-standard cameras and video cameras are not permitted, however point and shoot cameras are permitted. Discretion as to whether your camera is deemed as a ‘professional-standard camera’ rests with the Promoter’s security staff and debate will not be entered into. Unauthorized photography may result in images being deleted by security staff. Any items or objects considered by the Promoter and the Venue to be dangerous or capable of causing public nuisance and that could be used to distract, obstruct or interfere with any performer are prohibited. Example of some prohibited items are open fires, naked flames, laser pointers, fireworks, flares, flags or banners, whistles, horns, musical instruments and loud hailers. Space is limited on the grass so please be considerate. You will be directed by security and Event staff to condense your setup if it is deemed excessive. The decision to cancel an Event will be made on the date of the Event. The Event will only be abandoned if the Promoter deems the conditions dangerous. Refunds (whole or in part) will only be available at the point of purchase, if an Event is abandoned or cancelled. The Promoter has the right to re-schedule or cancel the Event. If theydo so, the Promoter will use best endeavours to informticket holders via theirwebsite. If the Event is re-scheduled, ticket holders unable to attend the re-scheduled Event must apply for a refund within five working days of the new date. Free or complimentary ticket holders will not be entitled to a refund for a cancelled or re-scheduled Event. In theevent of a change of the support act line-up change,refunds will not be available as the Promoter reserves the right to change the support act line-up without prior notification. Warning: Exposure to loud music may cause damage or loss to your hearing. If you are planning on attending an Event we suggest wearing earplugs if long term hearing damage or loss is of concern to you. Warning: The Venue is an outdoor venue and although the up most care has been taken to make the Venue safe it may contain dangerous and uneven surfaces. Patrons should stick to designated paths where possible and exercise care and caution when entering or on the Venue premises. In emergency situation or evacuation, you must follow all official directions by Venue staff & security. To the maximum extent permitted by law, no responsibility for loss, injury or damages will be accepted bythe Promoter and the Venue that was caused by the patron attending the Event or by entering orbeing on the Venue premise whether caused by the negligence of the Promoter or Venue orotherwise.